Here it is, the long-awaited 70’s trio! There are things to love about this set, and it’s great that Bonne Bell released something we’ve been asking for: decade flavors. I’m really happy about the matching tubes, too. The flavor choices are playing it safe, but Peach is a home-run. I have been using Peach non-stop and I firmly believe it’s one of their best flavors. As for Piece-a-Cake, well we’ve been deluged with bakery type scents for way too long now but this particular flavor has always been an exception. This is a very good effort–I think the 70’s version has just a bit more citrus, but it’s not glaringly obvious. BB did these two classics justice. OK, now I have to talk about Peppermint. I hate talking about Peppermint. It keeps breaking our hearts and yet we keep going back hoping this time it will change. Look, this was the perfect time to reintroduce the lovely, biting formula we miss so much. It didn’t happen, so now I say let Peppermint retire in peace. Peppermint is tired of youngins like Vanilla Mint stealing its iconic name and tube. Jokes aside, the new formula isn’t even vaguely reminiscent of the original. It’s misleading to keep putting the Peppermint label on it. Despite that mishap this is a good collection and a must have. The tubes, fonts, and 2 of the flavors are amazing. Plus I support innovative releases like this, I hope there are more in the near future! I loved the Peppermint. I got it in a trio with Red Raspberry and Grape on my ninth birthday. These were my first Lip smackers ever. Follwed by Bubble gum and Cherry in my stocking that same year. And the rest is history. really sad about the Peppermint. But! i do love the Vanilla Mint BB has done. I feel as if vanilla mint is being released too much though. There’s the vanilla mint Christmas one with Mickey Mouse on it, butter mints for Easter 2014, and the vanilla mint one in the Frozen collection. The mint flavored Cinderella Lip Smacker also smells sort of like vanilla mint crossed with peppermint. Bunny Cookie, I know you hate the newer creamy peppermint scent, but I actually like it. It probably doesn’t beat the older version though. I like tingly minty lip balms myself. It’s not that I hate vanilla mint, it’s that it is being labeled incorrectly as Peppermint. Ohhhhh! So this specific peppermint actually smells like vanilla mint? How disappointing! I finally received my shipment of “vintage” Peppermint just now. DEFINITELY more vanilla mint than peppermint. I like it, just not as much as original Peppermint. And I still haven’t received my vintage peppermint shipment yet – they called me yesterday about my previous order, lol – I’d emailed customer service a couple weeks ago, took them this long to respond, they’ve just been swamped with orders because of the sale of the company. It took a bit for mine to arrive as well. I hope you get it soon, maybe Monday? Would LOVE to see the ropes again. They have a use beyond wearing around our necks. I’d hang them in places I want lip balm like the bathroom and car rear view mirror. It makes them easier to grab out of a purse, too. Me, too, I’m excited – after reading your description, I think I may actually like these. I’m not worried, I know they’ll eventually get here, but I am impatient, lol. Wonderful! Except peppermint of course…but I’ve never had any of them and will be on the hunt for peach and piece of cake especially (well I guess the whole trio lol) but did you find these in a store or online? My rite aid got the other vintage flavors ( the shakes and sour grape ect) so I wonder if they’ll get these…since rite aid isn’t clearancing LS off yet I wonder…. Peppermint is more like air with a hint of peppermint! lol One of my orders of lip smackers finally came in today. Customer service said they were getting a high volume of orders which was the reason for the delay. I got peach and piece of cake in my order and think they are awesome! I HOPE they do a re-release of the Jeweled smackers and the Cosmic ones! I’d so buy all of those. Does anyone else miss these?! I miss the Comic Smackers for sure. I remember when I a pack of 6 of them to give to girls I invited to a slumber party. They had clip on caps, and I remember there was raspberry, rock candy, and I kept the strawberry kiwi one. I forgot the other three flavors, but it’ll jog my memory if I ever saw a picture of it. I remember using berry heavenly as a little girl. I really loved the scent and the blue color of it. Both that flavor and strawberry kiwi got me into the shimmer Lip Smackers. 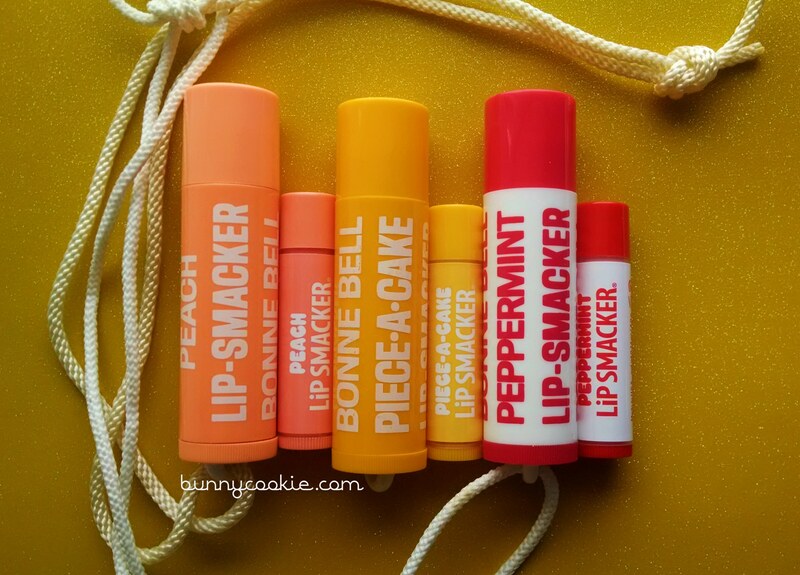 Speaking of shimmer Lip Smackers, I really loved the shimmer holiday Lip Smackers from 2014, especially butter brickle. I don’t know if you guys know this, but there was also a peppermint flavor that came out too, but it only came out in a trio with sugar plum and a sparkly strawberry liquid Lip Smacker. It smells like the peppermint flavor that’s been around for a few years. I remember those packs! My friend from middle school got a 6 pack of them for Christmas and I liked them so much that I bought them for myself. There was also another 6 pack with other flavors. I remember most of the flavors: moon rock candy, lunar lime, strawberry kiwi comet, planetary berry, berry heavenly, red licorice launch, gumball galaxy, martian mallow, mint chocolate ship (yes, it was spelled that way lol), stellar strawberry. I also think there was some kind of orange sherbet flavor in this collection. What does Butter Brickle smell like? Maria, its close to butterscotch, but with a hint of warm buttery caramel. Its a very rich flavor. And Bonne Bell really nails the buttery flavors! I got kettle corn in a trio not too long ago, and I LOVE it! They do! I love my kettle corn. I also recently got creamy caramel and salted caramel in my order and enjoy those as well. Bunny Cookie – where did you find your Peach, Piece a Cake, and Peppermint biggys with the lanyard? Please let us know. Thank you – and I hope everyone has a beautiful day! Cathy–the biggies are from the 1970s, not a current release unfortunately! Oh I loveeeee the Dulce de leche and Kettle Corn. Is Creamy Caramel anything like Dulce de Luche? I don’t have dulce de leche lip smacker so I don’t know for sure, but I think they would be super similar or the same. When I eat dulce de leche (the real thing lol ) on my flour tortillas, it seems similar to caramel but more liquidy. They’re releasing a chocolate mint flavor? Yes, I hope it’s good! It’ll probably be the same as the mint chocolate chip flavor that we’ve seen before in the PF collection and also in the mint chocolate ship of the cosmic smackers in the late 90s/early 00s. Its on the Lipsmacker site?? I see it now! So it’s part of the vintage Lip Smacker collection? I wonder if they’ll come out with banana marshmallow. I got my Cupcake set, my extra Soda set, my Girl Scout set and the Paul Frank set ….I definitely like Berry Buttercream, Chocolate Peanut Butter. Thin Mints and I like the angel Food cake from the PF set. Chachis Lollipop Hearts Liquid is pretty yummy. Im more a balm lover tho. I ordered the Holiday refreshments set for me and my daughter. Cant wait to get the Snowflake Cocoa. Snowflake cocoa smells like the yule log Lip Smacker from the 2010 holiday collection. Is it normal that I have dreams about shopping for Lip Smackers? I had a dream this morning that I found this Disney Lip Smacker set with a HUGE biggy Lip Smacker. It came with a few normal sized Lip Smackers, and it also came with wigs you could put on top of the Lip Smacker tubes. Sorry. I’ve been collecting for the past 6 years, and I really try to pay attention to the scents and if they’ve been used in other collections. Have you tried the frozen lemonade Lip Smacker? To me it smells sort of like the pink grapefruit/ice pop/evilly delicious punch type flavor that’s sort of citrus-y. I was expecting frozen lemonade to smell more like lemonade than it does. I was disappointed. Yes Renee Frozen Lemonade definitely smells like Icepop to me as well. Haha Renee that’s a really funny dream! Hey Bunny Cookie, have you managed to get the Easter 2015 Lip Smackers yet? I know they’re mainly repeat flavors, but I wanted to know what your opinion was on them. I noticed the scent for the jelly bean one is a little off. The color of the lip balm is different too. It’s been that bright pink color for years, and now they changed it to purple. Marshmallow chick smells a little different too. I love collecting Lip Smackers myself! I am wondering if you could send me a picture of where you store them? 🙂 it would really be appreciated! Lorena, I recently read that for long-term storage, the refrigerator is a good place. I’ve put all of my collection in Ziploc freezer bags (airtight), into cookie tins, then into the fridge. I have no clue where you guys live, but I found the Layer-it and Roll-it Lip Smackers at Kroger! I got the Roll-it Lip Smacker in cotton candy, and a Layer-it Lip Smacker in pomegranate lemonade. I LOVE the cotton candy Roll-it Lip Smacker. It smells just like the balm version. I’m disappointed with pomegranate lemonade though. I was expecting the lemonade part to smell more like…. Well, you know, lemonade. I think the formula has changed for the lemonade flavors. It’s that same ice pop type flavor that’s been coming out for a while. The pomegranate part smells just lile other pomegranate Lip Smackers, so at least that smells good. Wow…I am SO glad I still have the original Peppermint flavor. Well, the 90s one, at least, lol. I would still get the 70s trio. The peach and the piece of cake sounds interesting to smell. I love peach. I recommend the peach and piece of cake! They are both delicious! The piece of cake tastes like yellow cake with a hint of citrus. The peach is just like its name. Thanks for the info! I will! I couldn’t find ANY of the 70’s, 80’s, and 90’s trios at Rite Aid. Since they didn’t have those, I got a strawberry banana Lip Smacker instead. I hope they release them all over the US soon. I’m getting tired of never seeing the anywhere. Strawberry banana is a good flavor. I have the Paul Frank version. I have an allergy to the Paul Frank version.